Birds are a traditional love for artists. Their enchanting songs and mysterious ability to fly have mystified us for millennia. Our artist has created a humorous and colorful painting for us to enjoy. These fun pictures are perfect for any room that needs color and a point of interest. 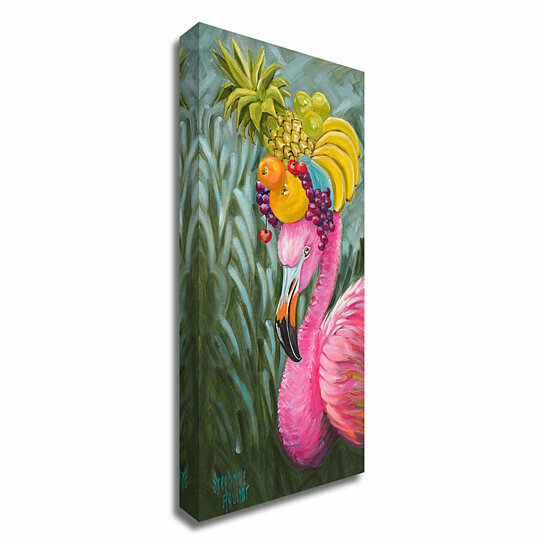 Show your sense of humor with this painting of a beautiful ping flamingo carrying a bouquet of fruit on her head. What perfect kitchen art. Tangletown Fine Art searches the worlds archives for the most relevant art to accent today's design trends. This painting printed on thick Gallery Wrap Canvas is printed using the latest Giclee techniques on museum grade canvas. Our Giclee printer uses 12 colors to create a rich color gamut giving the deep dark and subtle highlights of an original painting. Our gallery wrap canvases are printed on 100% thick cotton canvas because we noticed that the cheap poly canvas our competitors are using is "sagging" or "draping". 100% thick cotton canvas will loosen naturally when the wood expands and it will shrink like fresh jeans just out of the drier when the wood shrinks. The canvas is then stretched over kiln dried � finger jointed pine. With finger jointing technology the wood stays straight and strong. Finger jointed pine frames are superior to other stretcher frames because we cut around the knots and re-join the wood using the finger jointing technology. When wood expands and contracts around knotty wood it changes it's shape. With finger jointing technology the wood stays straight and strong. The resulting piece of art will last for years of enjoyment.